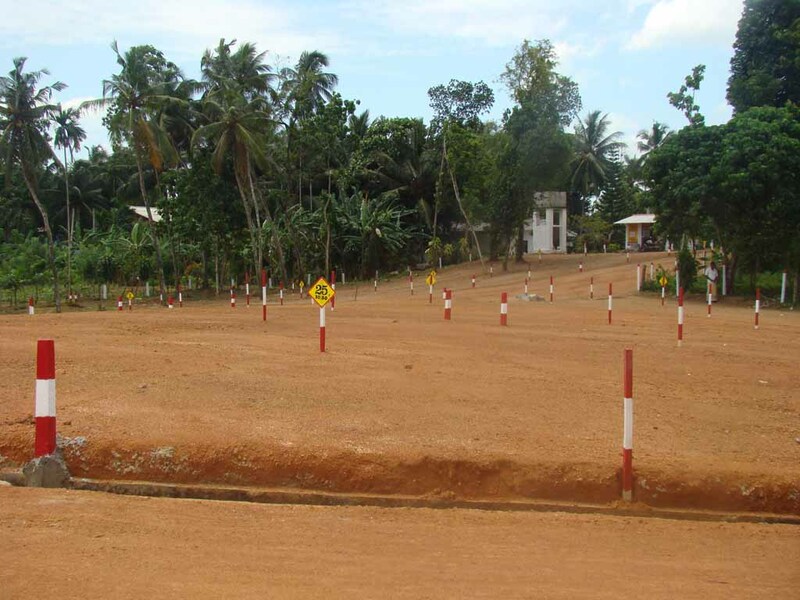 Uplift Lives: How to buy a land in Sri Lanka ( as a citizen )? How to buy a land in Sri Lanka ( as a citizen )? In Sri Lanka, there is an ancient folk tale call four laughs. One of those laughs is, how the land laugh at people who fight for the land. There's a short story call "How much land does a man require" by Leo Tolstoy. It beautifully elaborates about a man , in his lust for land, forfeits everything. Love for the lands, men have is such, unstoppable, unavoidable and never get over. But every family need a land. Buying a land in Sri Lanka is something you should do with extreme carefulness. Otherwise, if you get in to courts for a land case, case with drag your life time as well as your child's life time and make the family bankrupt. Basic land laws in Sri Lanka is based on Roman Dutch Law. 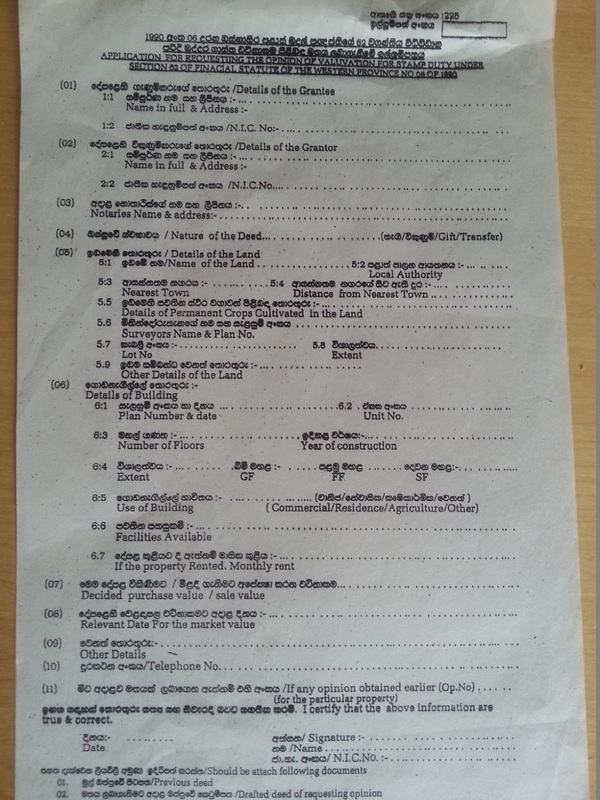 What are the Acts , which land law in Sri Lanka consists of? What needs to be considered prior to buying a land in SL? 1. What type of a land it is. That is whether it is a jointly owned land, whether it is a land subject to an ongoing legal case etc. Be very careful if there are joint owners to the land. If anyone is trying to sell you a land in a water reservoirs, beach , forest reservoirs, historical lands etc, you should know that those lands cannot be used for private use and therefore cannot be sold. Some lands will have to be given for the road development authority in near future. Say for example, if that certain land is in the scheduled area to build a high way, no point buying that land to build a house. That will be gone soon. This can be checked with the regional authorities. Though it is not a legal requirement, it is always better to check the neighbourhood surroundings of the land you wish to buy. For many reasons, it is good to do so. The obvious reason is you cannot live a peaceful life with neighbours who are much disturbing. It is up to you to decide where and with whom you should live. secondly, say if you want to start a big tuition class at the down stairs of your house. If you live in a highly residential area, that whole neighbourhood could get disturbed with happy school kids roaming around with much noise. If you want to start a tinkering shop, you for sure annoy your relatives. Same things vice versa. If you have children, check whether it is a child safe area. You might not have loads of fresh air in an area where there are too many factories. This is like the must do thing before you purchase a land. Not doing this properly is the reason for many land cases in courts today. Once you decide everything else about the land is fit in to your criteria, then you should request a copy of the deed from the land owner. You can get a lawyer to do it on your behalf. You have to check whether it is a "clear deed". For this you have to check the extracts of the title deeds. You can also request certificate of non vesting, street lines, recent survey plans from the seller if those are available. when someone purchase a property, it has to be done by a legal deed. That is the legal evidence that certifies who owns the property. It doesn't matter whether it is a gift, purchase, inheritance, donation or what so ever type of a transaction, there has to be a deed. 1. A deed has to be prepared by an attorney at law or a notary public. 2. A deed must be registered. 3. A deed must be signed by a notary with two witnesses. 4. This registration need to be done in accordance with the "Registration of Documents Ordinance No. 23 of 1927". 5. Person who is selling / gifting the land and the persons who are buying / receiving the land must be sighed in the deed. 6. Once registered, the deed gets a registration number which it can be tracked. Now it is very easy to do. You have to go to the relevant land registrar office with a copy of the deed. 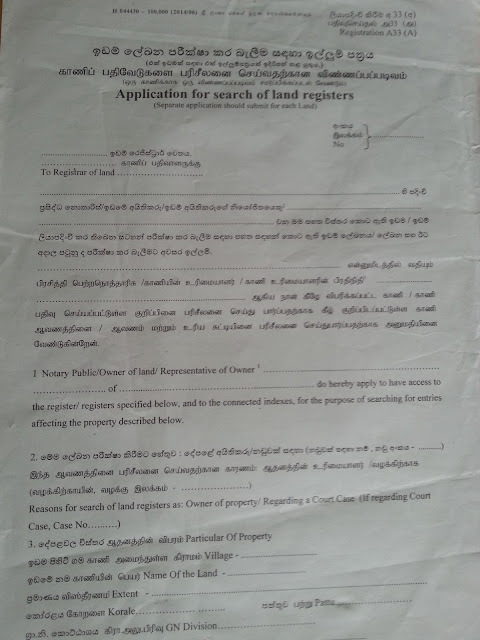 For example if its a land in divisional secretariat areas of Kottawa, Maharagama, Kesbewa, Moratuwa, Rathmalana or Dehiwala, then you need to visit the land registrar unit at Delkanda. "People visiting the Nugegoda Delkanda Land Registry for land title deed extracts can now obtain them in 30 minutes, says Delkanda Land Registrar Diluka P. Vithanachchi. “Earlier the public had to spend about two days for this. They had to visit the land registry twice to obtain an extract. But now they obtain the extract within about half an hour on the very first day they visit the land registry for this. This is because of the financial and technical support the ICT Agency of Sri Lanka (ICTA) has given to this registry under the e-land register project. ICTA has provided the facility for scanning and obtaining print-outs of extracts of title deeds of lands." Details of the land deeds registered from 1928 to now can get checked by land registrar. Land deeds of Colombo can get checked by the land registrar office situated in Sir Markus Fernando Mawatha near Colombo Muceum. All the details of the land registrar offices around the country can be taken from the below link. What ever the deeds in Colombo which does not belong to Colombo and Delkanda offices are at Homagama office. When you go to land registrar, you have to fill a form call "Application for search of land registers". (form attached). When a land registry receives a copy of a fresh deed for the 1st time, they do the registration of it, by writing it on a new page in the land registry book. Then the deed gets a vol number and a folio number. These pages has all the details about the deed such as these. when the land is purchased by someone else, again a new page will be opened with a note on previous page saying its taken to a new page. In the new page also , previous details too are mentioned in top left corner of the new page with mention "brought forward". Therefore, who ever buys a land can find the whole history of ownership of the land in this registry. No body should buy a land without checking these details. Only a lawyer, notary or an authorized personnel has a right to check these details. If you decided to buy a land, after all checks, then an attorney have to prepare a draft deed and send it to the relevant provincial revenue department for valuation. Every provincial council has a revenue department. For example this is the link to the revenue department of southern provincial council. Central province has two offices for revenue collection. One is at Densil Kobbaakaduwa Mw, Baththaramulla and the other one is at Old Kesbaawa road, Nawinna. 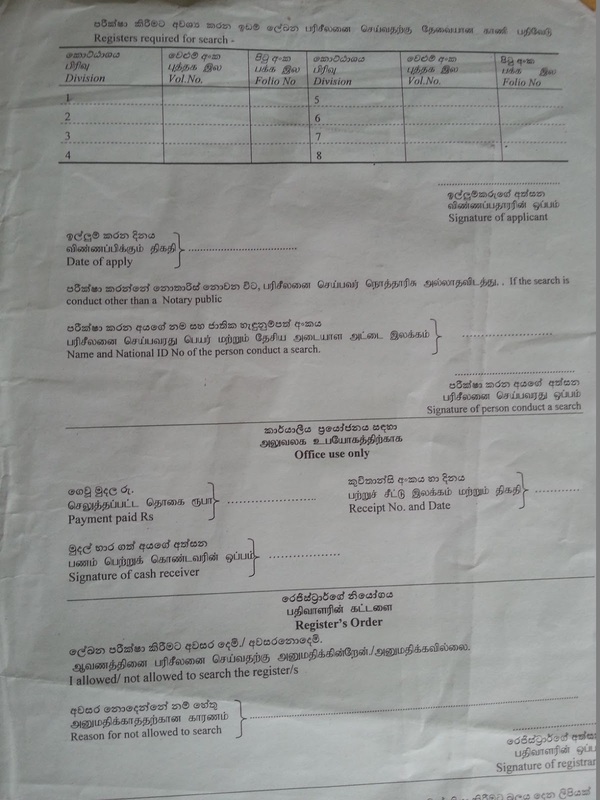 draft deed should be sent with the below form to the revenue department. Then they asses the stamp duty charges and certify another copy of it. This amount should be paid within due date and the receipt should be presented all 3 copies of the deed. Then they place their seal on the deed and hand it over back. Then only you can send the deed for registration. I'm sure most people knows this as an obvious fact. But just mentioning in case if anyone needs to know. There are many papers with land sales advertisements and many web sites too. Be careful if you are buying a land through a broker. Most brokers are fraudsters and it always costs more. I think there supposed to more documents such as street line, valuation report,COC,nonvesting certication etc...??? ?